Some weeks ago, Charles Saxe Coburg-Gotha or ‘Windsor’ as he likes to call himself, aka The Duke of Cornwall, very ‘kindly’ sent a cheque, for an undisclosed amount (£500 according to An Helghyer’s sources) to the people raising money to erect a statue in memory and honour of the countless miners who lost their lives or suffered debilitating illness from their work underground in the St Just and Pendeen districts. Now, the good people of St Just and Pendeen have, for years, been doing all they can to raise money to have made and erect this fine statue. It is expected to cost around £40,000 and they, through various auctions, public events etc have raised thousands towards it but are struggling to reach the target. My point, is this: I find it a bit sick that the Duke of Cornwall couldn’t have coughed up the remainder in order for this statue, which was first mooted in 2000, to be made. Since the creation of the Dukedom in 1337, the successive Dukes have made a pretty penny out of Kernow over the years, with Charles being the latest leech. 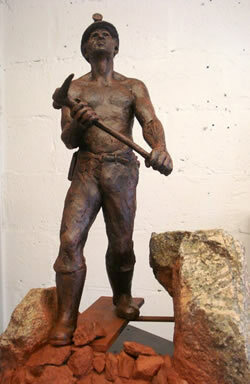 In terms of why this is relevant to mining and a miners’ statue is as follows: for a five hundred year period, ‘tribute’ or ‘coinage’ was levied against the tinners of Cornwall by the successive Dukes of Cornwall. This meant vast sums of money worked for, by Cornishmen in blood and sweat, leaving the country and going into the pockets of the gad-about Dukes to lead excessive and lavish life-styles. It has been worked out, that in today’s money, the revenue from tribute over the five hundred year period it lasted, is around £20 billion. Even after tribute had ceased, vast sums still poured (and still does) from Cornwall to the Duke. Edward Albert Saxe Coburg-Gotha (Edward VII) was Duke of Cornwall from 1841 until he became King in 1901. At 19, his wealth from the Duchy stood at, in today’s terms, £60,000,000. Huge amounts of Duchy income were spent on his gambling and the debts there accrued. In 1847, whilst the Cornish men, women and children from whom the spoils were drawn, were dying in the streets from starvation, the Duke was living it up, sailing down the Nile, accompanied by an entourage of boats containing some ten thousand pints of beer, three thousand bottles of champagne and four thousand bottles of claret! And so to today. Ol’ Charlie can only spare a donation. You’d think that out of some sort of thought for the common man, whom over the centuries has created the wealth and paid for the homes this peculiar man now enjoys, he might see his way to shelling out forty grand (a paltry sum) in order to honour some of the bravest men who ever lived (and who actually knew what a hard day’s work was!). Alas no. After all, he’s only the head of a Private Estate, isn’t he? Today I have decided to lighten the mood. 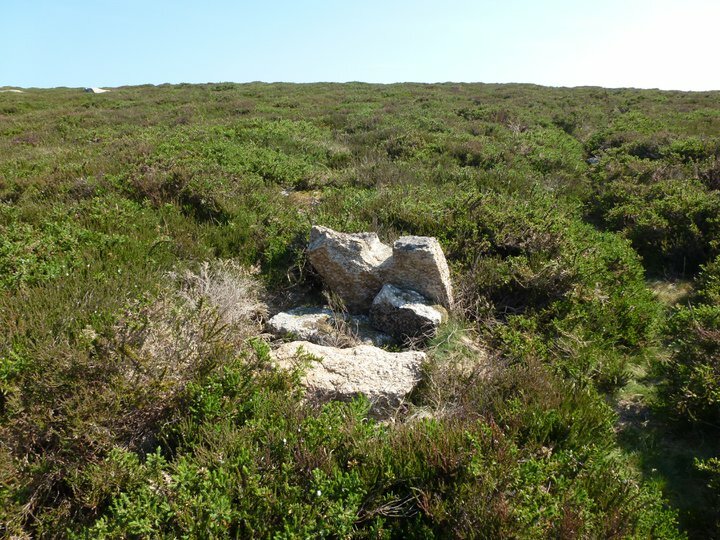 Below are two links – one on the good news that The St. Piran Trust have been given a grant to be used for the prep work on excavating St Piran’s Oratory in Perranporth. The other, a link to the brilliant Skynt: The Musical. This was the winner of the Govyn Kernewek 2010 award, which allows filmmakers a budget of £5000 to make a film using the Cornish language. Natural ‘England’ an unelected quango, are devastating the moors of West Penwith with their “Higher Level Stewardship” ‘conservation’ grazing regime. This means fencing, cattle grids and horse gates where hitherto there were open spaces and open roads. Once you add the enormous and potentially dangerous longhorn cattle into the mix, our beloved and pricelessly historic landscape, suddenly becomes a no-go area. NE did a deal with certain farmers, who were then able to graze cattle upon the open and public spaces of the West Penwith moors. £27,000 p.a. covers them to let loose leviathan-like cattle to graze but also to intimidate. It has already been stated the cows could be deadly if with young. 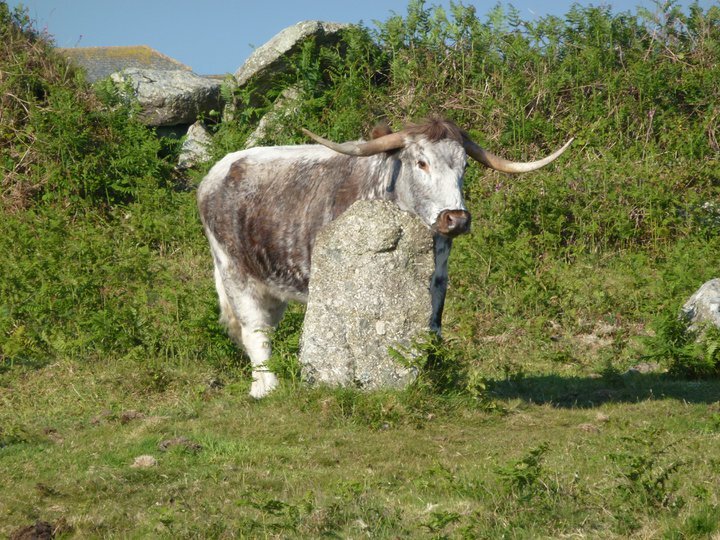 But the NE cattle on the Penwith moors have so far discouraged walkers and riders (a drop as much as 75%), dislodged three standing stones and churned the country into a morass (along with their four-wheeled counter-parts/owners). So how does that sit with NE’s lofty assertions? It has been a disaster from the start, with more BS being fed to the Cornish and the only winners being the farmers who graze the cattle. Overall, having a dictatorial quango named Natural England operating in Cornwall, smacks of all that is imperialistic and abusive, as does the utterly inexusable English Heritage. Neither, for all their talk, have the least respect for Cornish heritage, history or her people. How could we have ever managed without you NE? So the broken men an tol in the picture at the top of the article, may or may not have been caused by NE’s cattle. It’s a long way off the beaten track for someone to go with malicious intent however. These stones and all others have stood for millenia and but for Victorian fiddlings, have stood so since. Is it right that cattle should destroy what is precious to so many for the sake of a smug unelected quango and the bank accounts of the few? You and I can’t even touch Stonehenge, so why is it ok for Cornish heritage, which is as old and important to be so dismissed? In an article today, the This is Cornwall website reported, that the long-awaited second stab at getting Cornwall recognised as a national and cultural minority, within the Council of Europe’s Framework Convention for the Protection of National Minorities, was going ahead. Yesterday, ‘The Cornish National Minority Report 2’ was launched, with Bert Biscoe at the helm. We can only hope, as clearly much work (again) has gone into this, that this time we won’t be sidelined/ignored by the UK Government, who also ignored the Council of Europe last time round. Andrew ‘on the fence’ George and Dan ‘piss my pants’ Rogerson presented the report to the ‘Communities and Local Government’ minister Andrew Stunell at Westminster, which probably means that’ll be that, from their end. We, the Cornish, however, will not and must not let this pass. In twelve years, things have changed. The fact you’re reading this is a testament to it, (the internet has brought a greater awareness and accessibilty to all things Cornish). Things can’t subtly slide, quylkyn-like under the rug (or silk tie) of Duchy Hall. Sometimes you have to wonder, why the English establishment are so threatened by a small, repressed nation like Kernow? Or for that matter, Scotland, Wales, Ireland etc. You might say they’re not threatened at all, how could they be? If that is the case, why is so much done by them to try and keep the status quo? Is it for the benefit of Cornwall to be denied her inalienable rights to be an independent, free nation? Is it in Scotland’s interests to be a part of an unbalanced, out-dated act of Union? And despite 300 years of formal annexation by England, is it in Wales’ best interests to continue in this way for another 300? For centuries England has trampled across indigenous nations, waged war and interred dissidents but what makes the English establishment and certain English people so resistant to give back what was never theirs to take? In the case of Cornwall, it never was taken. No formal records exist of annexation. Cornwall always existed separately from England and earlier Wessex. In 936, the ethnic cleanser Athelstan forced the boundary of Cornwall from the river Exe in what is now Devon, back to the eastern bank of the river Tamar where it remains, in constitutional law, today. Maps showed Cornwall as a separate country. Many writers, ambassadors and historians wrote of Cornwall and the Cornish alongside England and the English. At his coronation, the maniacal mass-murderer Henry VIII listed Cornwall separately from England, while his daughter Elizabeth apparently spoke nine languages: five were the languages of Britain and Ireland which included Cornish and she had stated that she didn’t rule Cornwall. So what happened? After the war of 1549, England, in a fit of spite, “forgot” Cornwall existed as a nation and proceeded its insidious assimilation agenda which continues to this very day. So why is this carrying on? Why are groups and individuals ridiculed and denigrated for speaking of such things? It is because it has been erased from the collective consciousness, meaning those that do are loonies and fantasists. But who are the fantasists when the history is there for all who want it? Go on any Cornish fora and see the abuse levelled by English participants who blatently refuse the evidence put before them yet offer none to support their end. The same goes for sites like Wikipedia. What difference does it make to them? Is the English establishment and those individuals who persist with this agenda frightened of groups of people with a strong identity? Why can’t England exist peacefully alongside the other constituent nations of the British Isles? Perhaps they’re afraid we might all get together and give ’em a taste of their own medicine? But this is 21st century Britain. What Cornwall and the other Celtic nations want is not enmity and strife, only to take care of their own affairs, not be controlled by power-hungry puppets hundreds of miles away, who have no concept of the issues affecting the people of said nations. As we see from happenings in Scotland, things are changing, for the better. Kernow’s day too, will come. The establishment don’t like it, the quasi-facist dream is coming to an end. They’re afraid and England is shaking like a shitting dog.